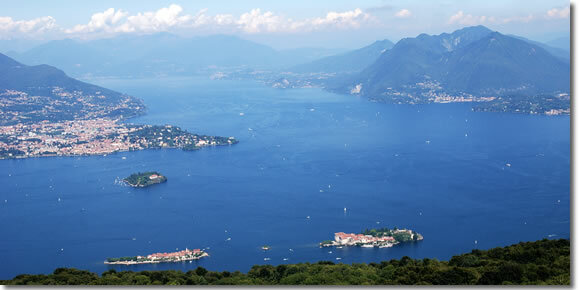 Despite its name, Lake Maggiore is, at 121 square kilometers, actually only Italy's second largest lake, after Lake Garda. This westernmost of Italy's great lakes is lined by forested shores and pokes its northern end into Switzerland but most of its length it in Italy, straddling the border between Lombardy to the east and Piemonte to the west. Lake Maggiore's popularity as a resort began in 1800 when Napoleon's Simplon highway from Geneva to Milan skirted its shores and Europeans from far and wide discovered its mild climate perfect for building villas and gardens, turning its fishing villages into holiday retreats. The gardens at Isola Bella.It became a renowned European pleasure ground, its deep, moody waters backed by the Alps inspiring great minds like Flaubert, Wagner, Goethe, and most notably Ernest Hemingway, who set part of A Farewell to Arms in Stresa (a novel based very closely on his own World War I experiences). In 1395, the Borromeo family fled political intrigue in Tuscany for Milan, where they bankrolled the rise of the Visconti to power. Building a pan-European financial empire, the family bought itself the Arona fiefdom in 1447. They tacked skillfully in the era's turbulent political winds, married wisely, and hitched their stars to the Sforza (on the gates as Isola Bella, look for a symbol of three circles representing the interlocking fortunes of the Borromei, Visconti, and Sforza dynasties) while they slowly acquired control over more and more of Lake Maggiore. Prize parcels of this lakeside land has stayed in family hands to this day (the modern Borromei princely family is very much alive and well), and their legacy—and continued munificence in sharing the family patrimony—make up some of the lake's greatest sights. 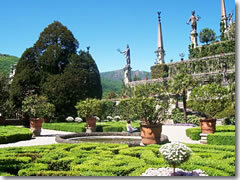 They left a colossal statue of their family saint, San Carlo Borromeo, outside Arona, and a castle in Angera, but most notable are the Borromeo gardens and villas on Isola Bella and Isola Madre, two of the "Borromean Islands" off the shores of the resort town of Stresa that together comprise Lake Maggiore's most significant (and photogenic) sight.How to get to Lake Maggiore: A car is the best bet, but there are also at least hourly trains up from Milan that service the major towns on the southern half of the Lake Maggiore's west shore: Arona (60–75 min. ), Verbania (75–100 min. ), Stresa (52–90 min.). Note that the fastest trains leave from Milan's central station, but there is more frequent (and only slightly slower) service from Milan's Porta Garibaldi station. There are also eight trains daily from Torino (Turin) to Arona (2–3 hours; most change in Santhia or Novara). The east shore of Lake Maggiore is best reached (and explored) by car. If you don't have a rental car (which is the recommended method), the easiest way is actually by boat. The is also a regular bus service along Lake Maggiore's western shore between Arona, Stresa, and Verbania operated by S.A.F., tel. +39-0323-552-172, www.safduemila.com), but it runs less frequently (and services fewer places) than do the lake ferries. Finally, you can take a train up the west shore of the lake past Arona and Stresa as far as Verbania (at which point the rail lines leave the lakeside to turn northwest toward Switzerland). The northern fifth or so of the lake is actually in Switzerland. The towns on that side of the border are a bit more disappointingly staid, modern, and, well Swiss than their Italian neighbors—though if you're a fan of the artistic Arp clan (Jan, Hans, and Margherita), there's collection of their works in the modern art gallery of Casa Rusca, in Locarno, the main city of the Swiss end of Lake Maggiore.